Photo: Mary W. Adams House, ca. 1905, 1923 Lake Avenue, Highland Park, IL. 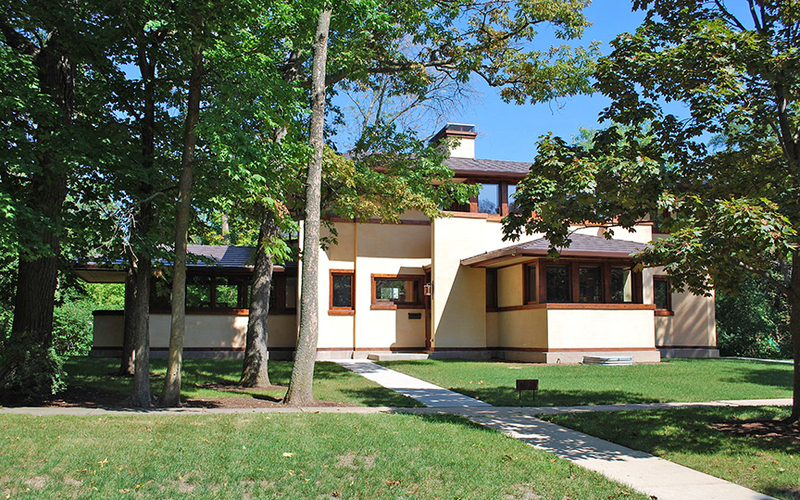 This plaster-surfaced wood-frame house was designed by Frank Lloyd Wright. Listed on the National Register of Historic Places in 1982. Photographed by User:Ronincmc (own work), 2012, [cc-by-3.0 (creativecommons.org/licenses/by/3.0)], via Wikimedia Commons, accessed April, 2013. The Lake County Courthouse and administrative offices are located at 18 North County Street, Waukegan, IL 60085; phone: 847-377-2000. Prior to its creation in 1839, the area that would become Lake County was an unsettled prairie, home to native Potawatomie Indians. The first permanent white settler was Captain Daniel Wright, who came in 1834. While Libertyville served as the first county seat, it was moved to Little Fort (Waukegan) in 1841.